Big Boy, a wirehaired fox terrier. Big Boy arrived as a Christmas present from someone in Virginia, Christmas, 1929 and was given to the sons of George Akerson, one of Hoover’s secretaries. Buckeye, a Belgian Police Dog [Malinois?] A gift to the Hoovers in June 1928, just after Mr. Hoover was nominated for President, from Gertrude Leavitt Hanna, whose family was prominent in Ohio politics. Mrs. Hanna's assistant inadvertently sent Buckeye's sister Mahana along at the same time. Mahana ran away and was never found. Buckeye moved to the White House with the Hoovers in March 1929. Mentioned in several letters in early 1929, subsequent fate unknown. Ch. Inglehurst Gillette (Gillette), a Gordon Setter and a prizewinner at the Madison Square Garden show. Presented to Hoover by Colonel William J. Donovan on Inauguration Day. Shortly afterward, he was given into the custody of a Dr. Mann, Superintendent at a nearby zoo, apparently because the dog barked too much. 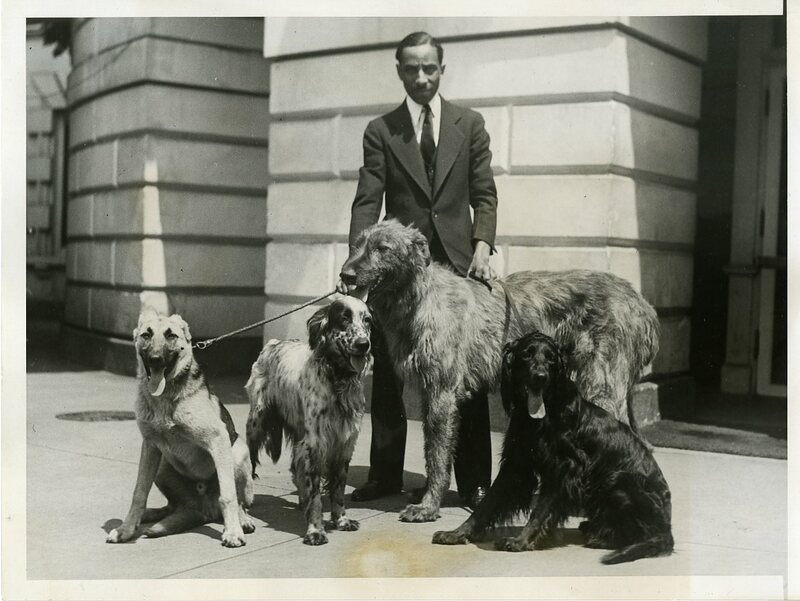 Gillette was photographed with the other White House dogs and received tags in the summer of 1930. Subsequent fate unknown. King Tut, a Belgian Police Dog [Malinois?]. Herbert Hoover’s favorite. The Hoovers acquired Tut from a friend around 1922, when he was probably one or two years old. Tut moved with them to the White House but was unhappy, so the Hoovers sent him back to their former S Street house, which had been rented by Connecticut Congressman Frederic Walcott and his family. Tut died in October 1929, though the Hoovers did not make the fact public for several months in order to avoid a deluge of donated dogs. Ole & Olay, Norwegian Elkhound puppies. 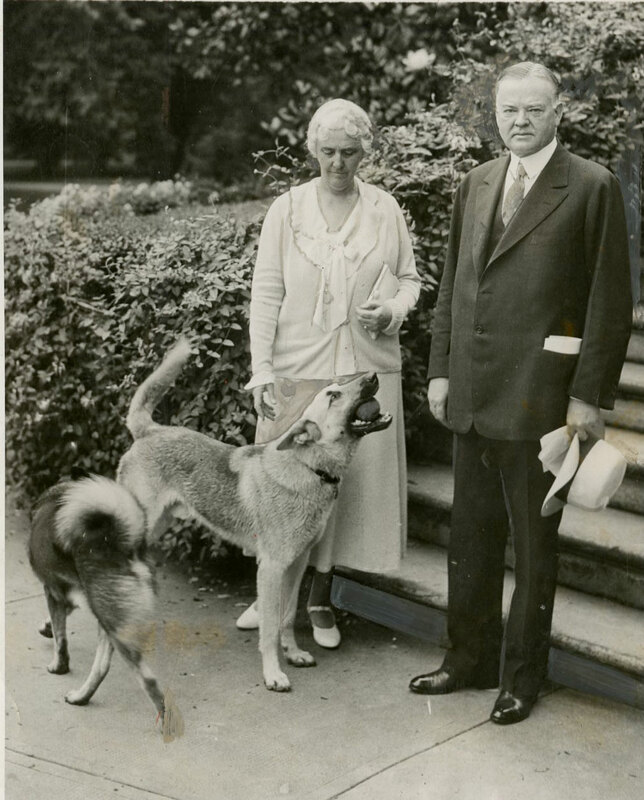 Listed in news articles with White House dogs receiving dog tags in 1932. No other information. Pat, a German Shepherd or Belgian Malinois, was a gift to the Hoovers from Captain Charles J. Mabbutt of Fort Benning, GA. 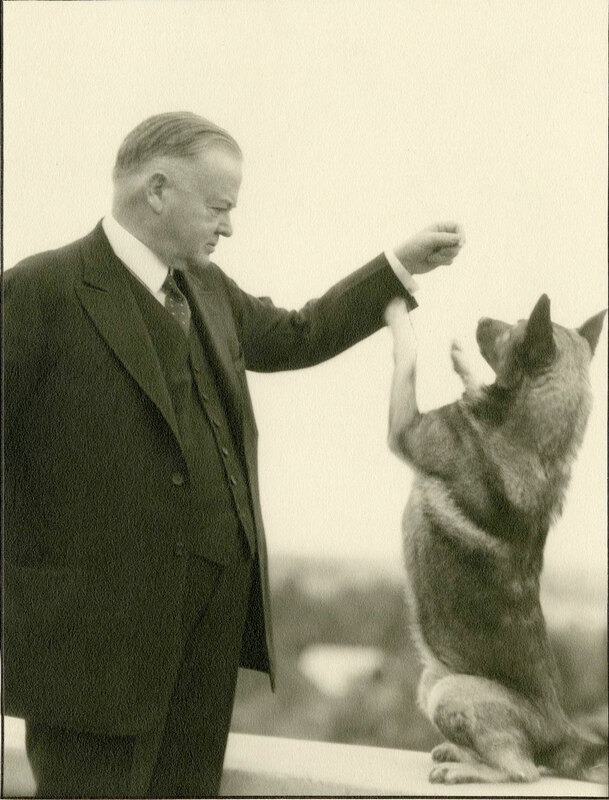 Given to Hoover in May 1930 as a replacement for King Tut, Pat liked to patrol the White House grounds. He went to Palo Alto with the family after Hoover's presidency. Ch. Southboro Markham (Mark), an English Setter presented to Hoover in September 1929 by Mr. D. C. Kok of Palo Alto, CA, a family friend. The dog was a national and international champion. No further information. Whoopie, a Schnauzer given to the Hoovers by Frances Dillmann of Chicago in March 1929. 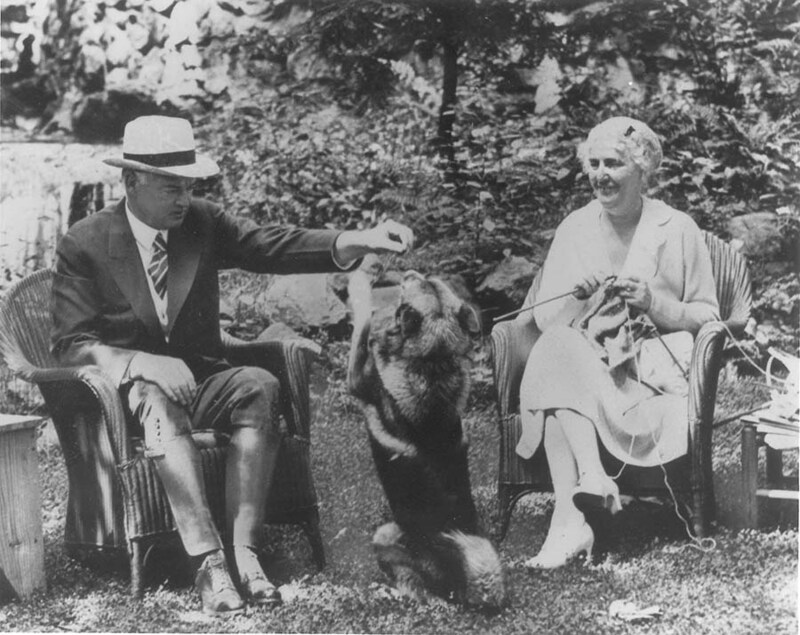 Because Whoopie seemed discontented with life in the White House, Lou Hoover gave the dog to Mrs. Norwood Smith when she brought Padraic I to the White House. Billy Possum, a wild opossum that strayed onto White House grounds. Adopted by the Hoovers, it was kept in the pen built for the Coolidges' raccoon. Billy was adopted by a Maryland high school that had recently lost their opossum mascot. Kitty, a Persian cat given to Lou Hoover shortly after the inauguration. Was reported to have "the freedom of the corridors" in the White House; subsequent fate unknown. Caruso, a pedigreed "roller canary." Given to Mrs. Hoover by his breeder, Mrs. P. E. McCoy of San Francisco, in early 1929. Lived at the White House and returned to California with the Hoovers in 1933. Died ca. 1940 or early 1941. Allan's Alligators: Sometime in the early 1920s, Allan Hoover acquired two young alligators that he kept in the bathtub of the Hoover home on S Street in Washington DC. In 1922, he donated the alligators to the Smithsonian. Sunny Boy, a pedigreed cat, which won second prize in the Washington Cat Club competition in February, 1927. Mrs. Hoover acquired Sunny Boy from a Mrs. Whittemore in late 1926 or early 1927. There is no evidence that Sunny Boy lived at the White House. No further information. Cat, a Siamese. 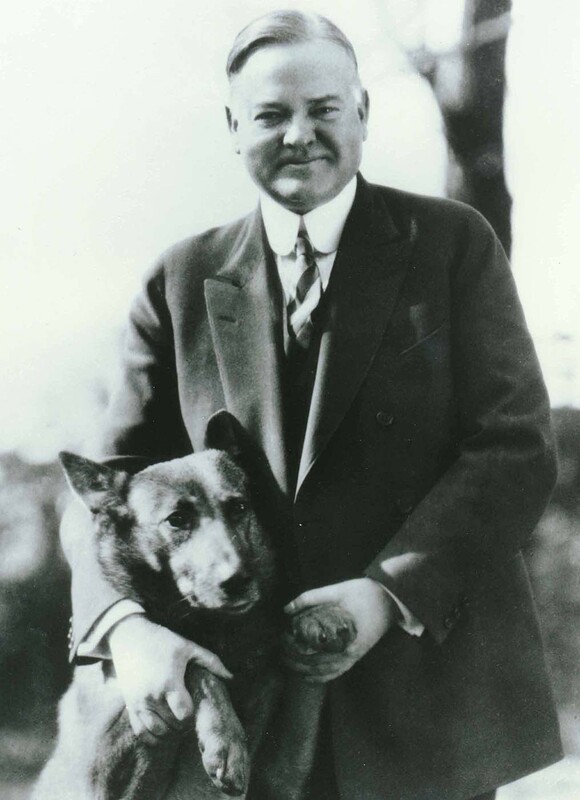 Mr. Hoover had this cat with him in his suite at the Waldorf-Astoria., ca. 1960.